The steps go up each Friday for the next 6-8 weeks. Friends have made super quilts with Bonnie Hunter's annual mystery quilt patterns, and the weekly format suits me right now. So here's step 1: 192 four patch blocks using the lighter background fabric and the cheerful 'constant' fabric. When was the last time I made a quilt that wasn't my own design? Years? Years and years! It's kinda peaceful, just following instructions .... For now, when all else is so busy. I do like both these fabrics. Happy happy. You can find my other Easy Street blog entries by clicking on the Easy Street label below. PS. I linked to this blog entry at Quiltville's first linky for Easy Street. See my previous blog entry for my fabric choices. PPS. The lighter fabric is Darls by Tanya Whelan/Grand Revival for Free Spirit. 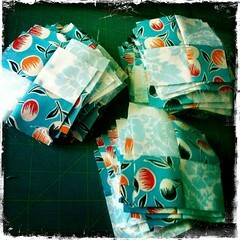 The turquoise blue cherries fabric is from Denyse Schmidt, Daisy Mae collection (2011). I like tossing modern-coloured Victorian flourishes against funky retro forties/fifties style! - it's working! PPPS. Thanks for the kind comments! - very much appreciated. Very nice color choices, can't wait to see what develops! Woah! I love LUV that print with the orange. Love your cherries fabric. Can't wait to see your quilt progress. I love both of those fabrics. Very cheery! You are so brave, love those colors! Such a great print. Happy Quilting! That's areally snazzy print you are using. I love it when Mystery Quilters add their own layer of mystery! Nice colours,very different from all the others, have fun with the mystery. I will check in at your blog to see the progress when you use these kind of colours/prints. Oh yes! I love your fabric/colour choices for the 4-patches. Looking forward to seeing the next step! Love your 'constant' - this is going to be such a fun quilt!